Seven years after halting an unorthodox restoration of the Isenheim Altarpiece, French conservators have resumed work on the celebrated northern Renaissance polyptych in the hope of getting it right this time. It took only six days in 2011 for two restorers with a cloth to strip the varnish off a painted panel depicting the Temptation of Saint Anthony and to revarnish it. They then started to repeat the process on half of Saint Anthony Visiting Saint Paul. 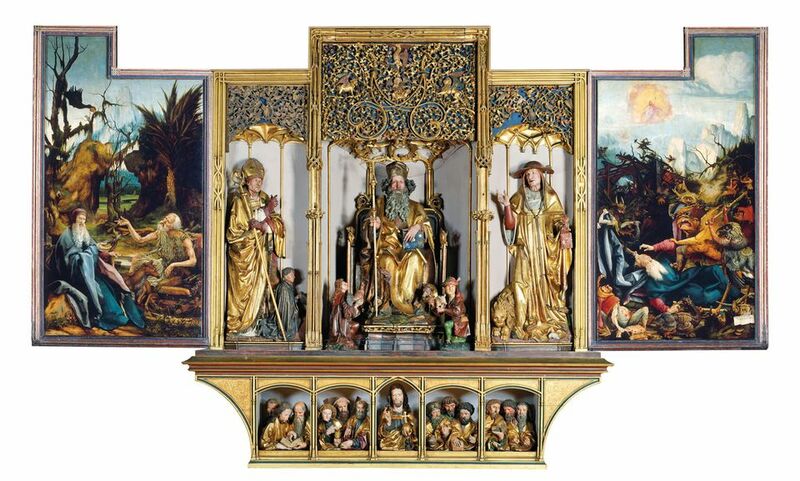 Launched before a major expansion of the Unterlinden Museum in the Alsatian region of Colmar, where the altarpiece is housed, the work was not preceded by a scientific examination. When the online magazine La Tribune de l’Art and the newspaper Libération expressed alarm at the speed of the intervention, the ensuing indignation prompted France’s culture ministry to step in and halt the pair. A study that began in 2013 concluded that no real damage had been done to the 1512-16 painting, regarded as the masterpiece of the German artist Mathis Gothart-Nithart, called Matthias Grünewald by art historians. It was a close call, nonetheless. The varnish had been left almost untouched in the darker parts but wiped off in the clearer sections. In some areas it had been reduced to almost nothing. The Centre for Research and Restoration of the Museums of France (C2RMF) is now planning to restore the vivid chromaticism of the work’s seven panels in the former Dominican church at the Unterlinden Museum. On 24 September, the centre sent sculptures of saints and apostles from the interior of the altarpiece, carved in limewood by Nicolas de Haguenau, to a Parisian workshop for conservation. The €650,000 project is expected to take four years and will be carried out under the supervision of a scientific committee chaired by Dietmar Lüdke, a retired curator from the Staatliche Kunsthalle Karlsruhe, in Germany. “The main objective is to restitute the aesthetic quality of this exceptional polyptych,” says Isabelle Pallot-Frossard, the director of C2RMF. “Prior studies have shown that it is structurally safe and its general condition is considered good, but we have to recover the colours and the graphic details now stuck under the varnish and the repaints.” Before meticulously removing most of the yellowed varnish, the laboratory will measure its thickness with three-dimensional optical coherence tomography, a high-resolution imaging technique that is used in ophthalmology to map and measure the layers of the retina. The goal is to ensure that there is no risk that the solvent will reach the original paint. Varnish will then be reapplied. A total of 31 people will take part in the restoration, working in two teams: one for cleaning and stabilising the sculptures, led by Juliette Lévy in Paris, and another for the paintings, led by Anthony Pontabry in Colmar. Revered by many artists over the centuries, the altarpiece is viewed as a powerful symbol for France and for Europe. Its 11 painted scenes, depicting the life of Saint Anthony, the Virgin Mary and Christ, were commissioned by an Antonite monastery treating sick peasants and victims of the plague in Isenheim, a village south of Colmar. They include striking images of monsters and devils tormenting Saint Anthony and of Jesus’s tortured, plague-ridden body on the cross, typical of late Gothic art in the Rhine Valley. Having survived the destruction of the Reformation and the French Revolution, the altarpiece was taken in 1917 by the Germans to Munich, where it deeply impressed Otto Dix, Max Beckmann, George Grosz and Thomas Mann, before being returned two years later. It inspired the Surrealist André Breton, prompted Paul Hindemith to compose his opera Mathis the Painter and, more recently, stirred the imagination of the contemporary artist Adel Abdessemed. 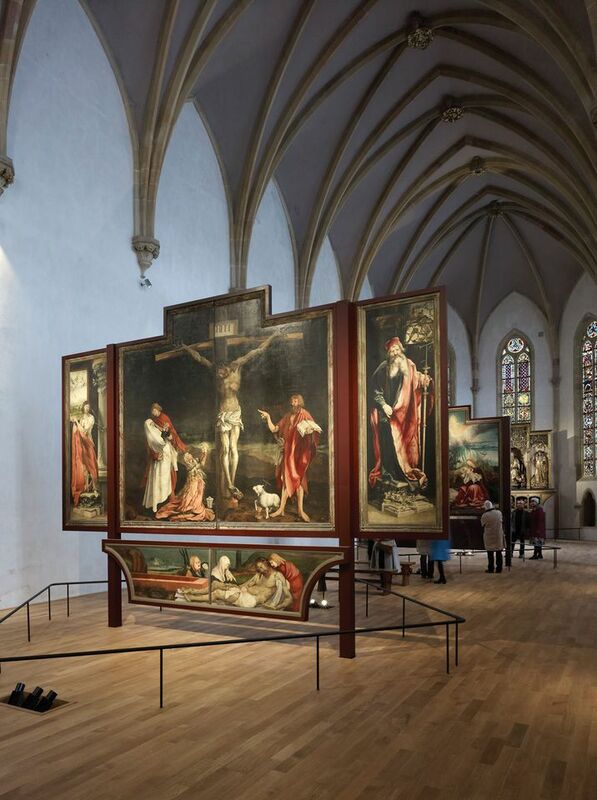 The altarpiece, which draws around 200,000 visitors each year to Colmar, will remain on view in the church at the Unterlinden Museum during the restoration work.